“My husband asked me not to get him treated. He said it was a waste of time and money because he thinks cancer is not curable. There were a lot of people bringing us down and telling us he won’t get better, but I know he can beat the disease. He has his entire life ahead of him, and I’m going to stand by him no matter what," says Jaishree, Sudarshan's mother. Sudarshan has been bravely fighting blood cancer for 6 months now. 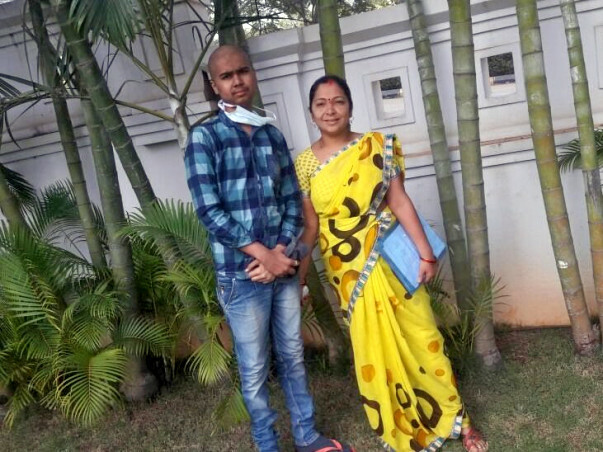 Despite several obstacles, his mother, Jaishree, took him from Bijapur to Bangalore for his treatment. 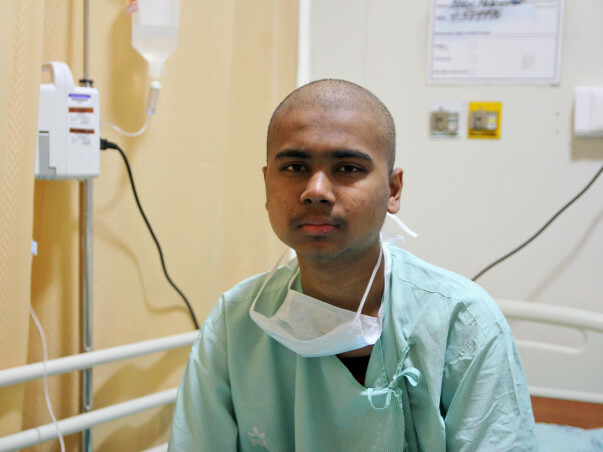 Sudarshan’s only chance of a healthy future is chemotherapy. He has completed 4 cycles, and needs 2 more. If his treatment is left incomplete, Sudarshan’s fight till now will be in vain. It’s been 3 years since Sudarshan has seen his father. Instead of worrying for his son's life after the news of his cancer, his father was among the first to tell Jaishree not to get him treated. However, Jaishree is not one to give up. Ever since her husband abandoned her and her four children, she has been their strongest support system. Sudarshan’s diagnosis shook her faith, but not for long. Sudarshan joined college to study science with the hope of becoming a doctor one day. However, he was in college for only a month before he was forced to drop out. He was taken to the doctor after he complained of severe joint pain. His teachers had also noticed that he was unable to even sit upright, and would often be sleeping at his desk. Sudarshan’s skin suddenly had white patches all over and his lower lip was swollen. He had several blood tests before he was diagnosed with blood cancer. With medication, chemotherapy and the unwavering support of his mother, Sudarshan’s condition is gradually improving. However, he still needs 2 more cycles of chemotherapy before he can begin to recover. Jaishree had started a travel booking company to support her family after her husband left. She earned Rs. 5,000 a month, but was forced to stop work to care for Sudarshan. With the help of her parents, she has spent Rs. 6 lakhs on his treatment already. However, Jaishree is at a dead end now. Sudarshan has blood cancer and needs chemotherapy to get better. He was abandoned by his father 3 years ago, who was the only earning member of the family. 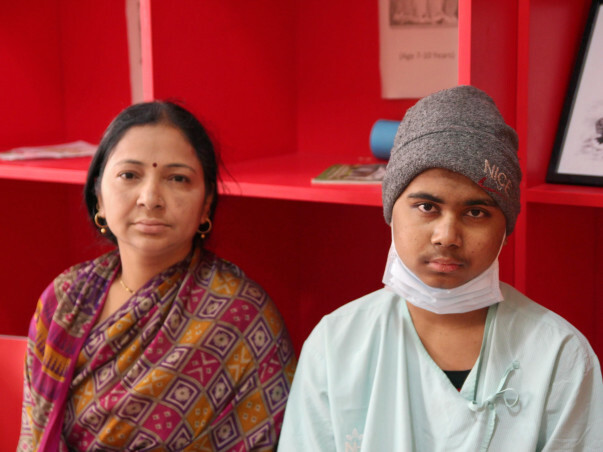 His mother, Jaishree, has been his pillar of support so far, but can’t afford to pay for his treatment any longer. 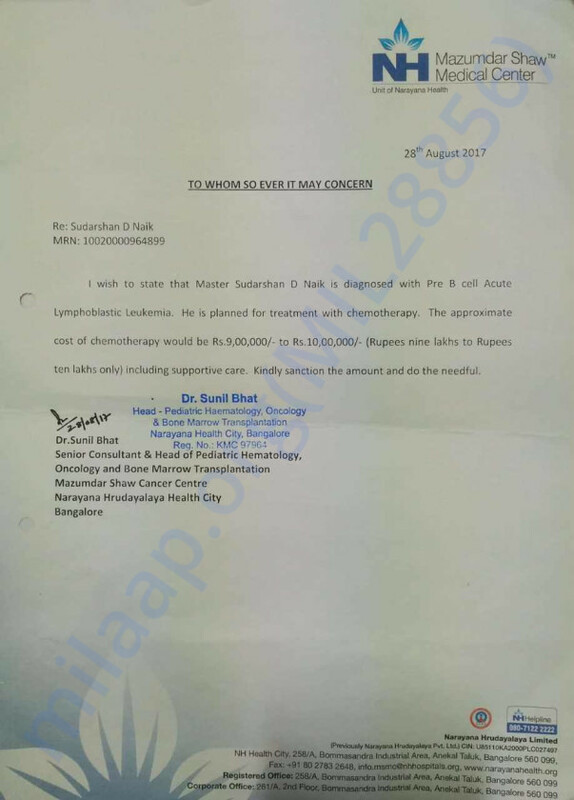 He needs 10 lakhs to complete all his chemotherapy cycles and get supportive care. Your support can save Sudarshan and give him a chance at a bright future. Sudarshan is doing ok. He is recovering and is on medications. He is asked to come for his regular check ups to the hospital. Thank you for the love and support you have shown towards Sudarshan. Here is a quick update on his health. He has responded well to the treatment and is on maintenance chemotherapy and is now doing well. We would like to inform you that Sudarshan is now on routine follow ups with the Doctor post chemotherapy. He is recovering day by day. We hope for his speedy recovery. We will keep you posted on his progress.